WE BELIEVE THAT FEASTING IS A BEAUTIFUL ELEMENT TOO YOUR TIME SHARED. ANY DIETARY RESTRAINT IS GENEROUSLY CATERED FOR . ENJOY EVERY MORSEL IN YOUR SECLUSION... BREAKFAST IN YOUR HIDEAWAY IS always INCLUDED There’s something enchanting about balancing nourishment with fun, adventure and wellness. For starters, our house made granola is delicious and served best with a dollop of Greek yogurt and fresh seasonal fruit from the jars in your fridge, TO CONTINUE ...... WILL IT BE CONTINENTAL OR COOKED? 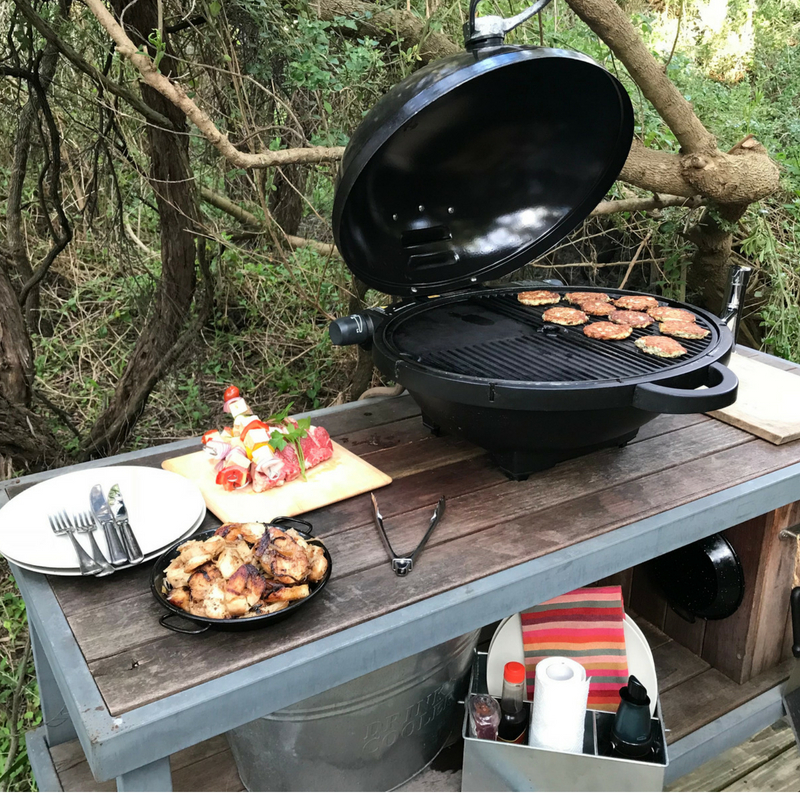 If you're after a full hearty cooked breakfast, you can go bush and flirt with the BBQ in your safari-inspired kitchen out on your deck. Nothing gets fresher than that! Everything you need, local free-range eggs, bacon, Italian sausages, fresh tomatoes... Or slathers of avo, squeeze of lemon, smoked trout, Meredith goat's cheese on toasted ciabatta? All from the continental platter with our butcher's famous ham, breakfast cheese and super lush ripe truss tomato. Feast away. The breakfast provisions tucked into your fridge & breakfast basket are always seasonal, fresh and plentiful. Enjoyed BEST at whatever time you like. THE DRINKS IN YOUR FRIDGE ARE ALL COMPLIMENTARY! The filtered water, milk and orange juice will be replenished daily. keeping your seclusion and coastal immersion in mind, chef has designed two ways to DINE IN! Your hideaway has a safari inspired 'bush kitchen' out on it’s private deck, compete with hot water sink and a cute as a "BUGG" gas BBQ ready to go. This flavorsome menu is sent to you prior to your arrival for you to select from & pre-order. CAN YOU DINE WITHOUT WINE? Explore our fabulous vineyards, bring bottles by the boot load back with you. There is a short, ‘our favourite’ wine list if you don’t venture out, that will suffice in the most pleasurable way. The Ancestrale method of fermenting wine in a bottle to create effervescence. This technique, in contrast to the measured ‘méthode traditionelle’, is transferred to bottle whilst fermenting. No added sugar or sulphur. Tasting Seventeen Rows embodies the idiosyncratic nature of Pinot Noir. Site expression personified. Brooding yet buoyant aromas of dark plum, violet, and rich earth stem from meticulous vineyard management, vine maturity and extended maceration. The mule amongst racehorses. Sangiovese x Shiraz x Pinot Noir triptych; together in vat and barrel for 24 months. Sangiovese is the spine, quivering with acidity, sought out by Italians. Attached is the dark cherry, dried fig, roses, and warm embrace of Shiraz. Pinot Noir takes over the final furlong for a luxurious, satin-silk finish. The original field blend from our winery vineyard. A chorus of 5 varieties grown and fermented in harmony. Inspired by the autochthonous frog, Pobblebonk, joyfully inhabiting our soils and wetlands. The beauty of Pobblebonk is the chorus of this vineyard quintet – the pink fruits of Pinot Grigio, the sullen strength of skin-contact Friulano contrasting with the tingling acidity and opulent aromatics of Moscato and Riesling. Co-fermentation of Pinot Grigio and Friulano begins as a brooding, reductive moody wine ignited with the blending of classic aromatic varieties; Moscato Giallo and Riesling. The palate is a colourful tapestry of whole citrus fruits, jasmine tea, and orange blossom with a nutty background. TWO YOUNG VIGNERONS MAKING THEIR MARK Producing patient wines from single sites on the Mornington Peninsula. Silverwood vineyard established 1998. Viticulture managed by Kerri Greens since 2016. Harvested by friends over two separate days, in the first ten days of a sunny March. Our first foray into Pinot Noir was matched by the remarkably precise 2017 Vintage, flavour, tannin, acid; all the important things, all in balance. Succulent Pigface roams the cliffs of Kerri Greens. A Kerri Greens vineyard established 1998, Balnarring. Fermented wild in barrel, some new, mostly old. it’s a refreshing, not too bitter and flavoursome ride with this quintessential beer for the genuine worker - the quite achiever.